VENTURA, CA—Calling it the most effective outerwear on the market for short-term exposure to the elements, outdoor clothing company Patagonia on Wednesday introduced its new high-performance jacket specially designed for walking between the front door and car. 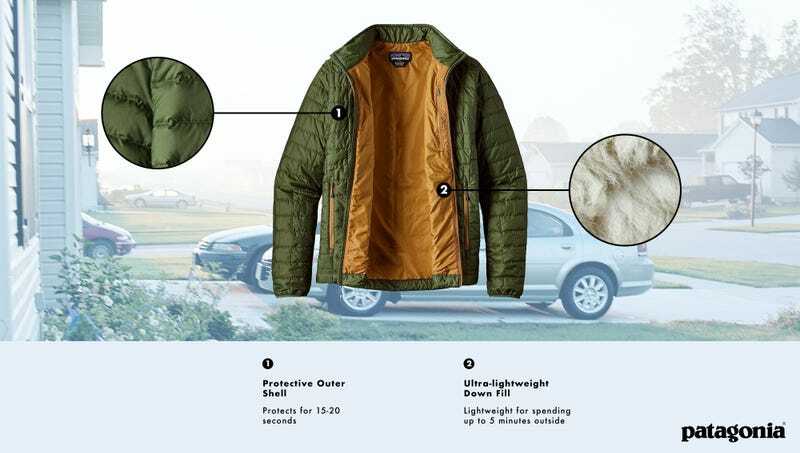 “With ultra-lightweight fabric and a center-front zipper with an interior storm flap, this new jacket is all you need to weather those few steps to your vehicle,” said Patagonia spokesperson Brad Hemlock, adding that the waterproof outer shell was constructed specifically to withstand 10-15 seconds of wind and rain until the wearer reaches shelter in their vehicle. “With two layers of insulating synthetic down, this jacket will shield you from whatever Mother Nature throws your way during quick trips to the mailbox or while running the trash to the curb.” Hemlock went on to say that the company would soon be releasing a new parka geared specifically toward those who need to throw something on when they get a little chilly at the office.